Since I snapped this photo of the nearly finished body for the Lush Cardigan, I have since completed everything but one button band. It was a really quick knit, I was surprised, given the lace panel’s need to be blocked before joining to the yoke and sleeves, etc. I highly recommend this pattern; its so easy but interesting, and doesn’t get tiresome. 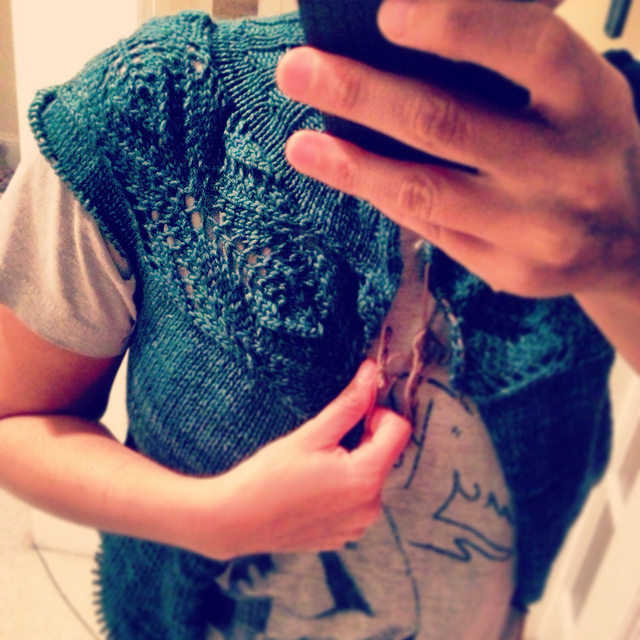 I knit this up using Madelinetosh Tosh DK in the Norway Spruce colorway and she is a beauty. Snaps of the finished product, soon.